I am passionate about educating and developing children with our upbeat, FUN music sessions. 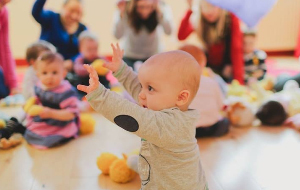 A relaxed informal class for your little one to learn through play, designed with the changing needs of your child to build confidence and it's great fun for adults too! As a mum of two boys, I know the value that music and movement classes bring. 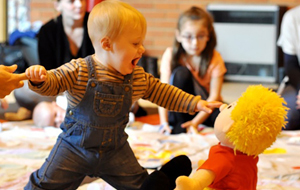 Percussion instruments, action songs and our vast selection of sensory props are used each week, that are appropriate, safe for their age and keep the sessions lively and colourful. Your children will also gain other important foundation skills to help them get ready for pre-school and school. 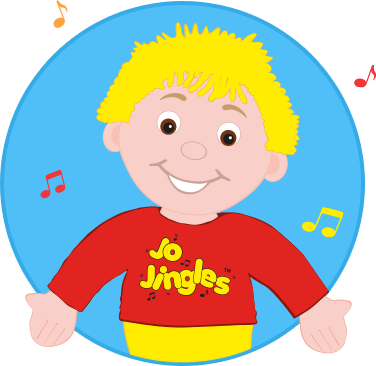 Jo Jingles is so much more than just music and singing! I look forward to meeting you in our classes soon. Initially I was apprehensive that I would be the only Dad in a group of Mums taking their child to a group but was made to feel so welcome.. Initially I was apprehensive that I would be the only Dad in a group of Mums taking their child to a group but was made to feel so welcome by Tracy and everyone at Jo Jingles Bradley Stoke! Having experienced a couple of other groups before this I can say this is definitely the best group that I have been to with the little one. This group has brought on her social skills no end and it’s all done in a fun, but also educational way, without the child realising that they are learning at the same time! If anyone is apprehensive about this, I can only say DON’T BE! You will be made welcome and Tracy is amazing at all that she does! You won’t regret joining or going. Keep up the good work, see u for many more terms to come yet! PS We have now been going for approx. 12 months and it only seems like yesterday, it’s as fresh today as it was a year ago! Tracy, I can’t thank you enough for today it was a fantastic party!!! Amelie absolutely loved it and seeing you too. Thank you so much for everything you’ve done for Toby over the years; it’s been amazing seeing his confidence growing over the years in your classes and the time and thought you’ve personally put in to help nurture that confidence too. I’m so pleased he got a couple of bonus weeks as Zak’s +1 before starting full time school! And now he’s off to conquer the world of musical theatre and has already performed at Bristol Old Vic, which shows just how far he’s come since hiding his ears from the ‘loud music’ and not going up to the box without me all those years ago! I contacted Tracey after having my second baby and noticing that my nearly two-year-olds speech wasn’t where we felt it should be. I contacted Tracey after having my second baby and noticing that my nearly two-year-olds speech wasn’t where we felt it should be. Tracey welcomed us back on my maternity leave and watched my daughter and devised a plan that as she was so interested in song and dance that we should get her to sing her way to talking. Within 4/5 weeks our daughter was singing her numbers 1-10, and her speech has come on incredibly. We started back after the summer break and surprised Tracey with Eliza counting and singing and her speech coming on leaps and bounds. To see Tracey welling up with emotion and knowing that she has helped us accomplish this was terrific to watch. We cannot thank Tracey enough for everything she does with children and how amazing her Jo Jingles classes are. She genuinely cares for all her children in her classes and gives a hundred per cent into helping them and you through any issues you may feel your child is having. I wanted to thank you once again for all you did to help our little man move forward in so many different aspects of his awareness. You did and you were absolutely incredible. He took to you almost immediately and loved every minute that you were with him, enriching his life in so many different ways. When I read your report, I was struck by how many of his reactions you noticed and recorded. In my former role as a reception class teacher, I was always on the watch for small changes in the children I taught and I know how exacting it is to be constantly alert and adaptable to small developments in their awareness. To write those observations down was most kind of you, both as a keepsake and as a helpful source of information about our little man showing how he has moved forward in a short time, where he is now, and as a forward guide for Mummy and Daddy. The recommendations are a great source for them. I loved the idea of hiding things in a bag to motivate him to find out the surprise inside for himself. So many small but brilliant observations of his reactions. I just wanted to say that Ted and I have really enjoyed your classes and shall miss them. You are like a ray of sunshine on a cloudy day Tracy, making us all happy and you very much deserve all the awards you keep wining! Thank you so much for making Isla’s Jo Jingles experience so fun and engaging. She has absolutely loved coming and has learnt so much from it. Thank you for all your effort and commitment to making it such a fantastic group. 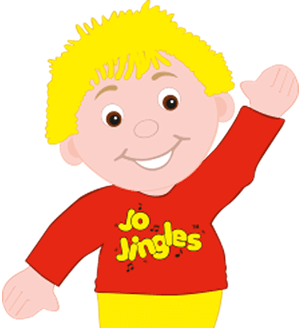 I can't recommend Jo Jingles enough. It was the only class I took my girls too in the early stages and I was terrified of going with my twins. The first time we walked in Tracy greeted us with such warmth and infectious energy that the girls and I joined right in! We had so much fun and looked forward to going every week. So many other classes needed 1:1 ratio but with Jo Jingles I could do the songs with both of them on my lap or Tracy would take one of the girls for me. I can never thank Tracy enough for getting this twin mum out of the house & giving me the confidence I needed as a first time mum with 2 babies! So much so I went on to have another baby and took 2 year old twins and a new-born to classes! 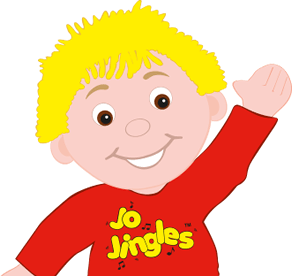 Jo Jingles is simply brilliant. So it was December 2014 when I brought Ellie to her last class with you, she was devastated at having to leave after nearly 4 years! So it was December 2014 when I brought Ellie to her last class with you, she was devastated at having to leave after nearly 4 years! And there wasn't a local class in Scotland...... which was a shame as I'd have liked little Susanna (now 20 months old!) to go to it from very young, like Ellie did; Ellie was 4 months old when we started! Until last week!! Felicity Mellor may have told you - there is now a local class!! Went to the first one last week, and Susanna knew half the class already, and loved it! And I was slightly concerned by how well I remembered some of the songs! But it's fab. I still follow your Bristol JJ page, and it's great to see you doing so well, you were brilliant at it - and I'm sure you are even better now! Tracy Bees is by far and away the best early years activity leader I have come across. She takes an incredible interest in each child and treats them all as special individuals. Tracy's enthusiasm is infectious and her clear joy at seeing each child progress is evident for everyone to see. I would highly recommend Tracy Bees Jo Jingles classes to everyone. Tracey is amazing! Really really amazing! She is so expressive and obviously genuinely loves her job and cares for the children. Tracey is amazing! Really really amazing! She is so expressive and obviously genuinely loves her job and cares for the children. My son learnt so much in Tracey's classes (including how to tidy up!) and even crawled for the first time during a class. Every lesson was different including different types of music (from blues to reggae) and different types of movement and instruments. I enjoyed it at much as my son did and I will miss the classes as much as he will. Tracey became a friend and it was great seeing all the children grow up and learn together. If you want something fun and educational for your baby-toddler-preschooler, then Tracey and Jo Jingles is the place! I have taken my daughter to Jo Jingles in Bristol with Tracey since she was 4 months old! My daughter has loved every minute of the classes. What's On 4 Kids Awards 2017 - Winner! What's On 4 Kids Awards 2017 - Finalist!